WARNING: Do this at your own risk. 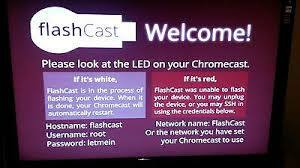 You may damage your Chromecast if a mistake or error occurs. 1. 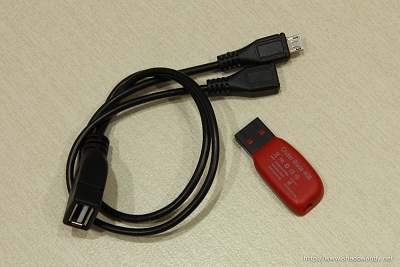 Install the Flashcast Image of the downloaded ZIP file to the 1GB+ Flashdrive. 3. Plug in the other end into the Chromecast dongle. 4. Hold down the reset button on the Chromecast while plugging it into the power cord. 5. Carefully, watch the screen’s warnings & suggestions & do as the suggestions, watch for any blinking light on your flash drive. 6. The Chromecast will power up. On your TV you will see a message that it is rooting. 7. The process will automatically execute the unsigned kernel, kick off to a script that replaces /system with a rooted one. 8. That will then wipe/erase data, and reboot back to the normal system. This process should take a few minutes, go grab a cup of coffee. 9. Never unplug anything while it is installing. 11. You will see a new splash screen, then you’ll see the Setup screen. And there you have it! 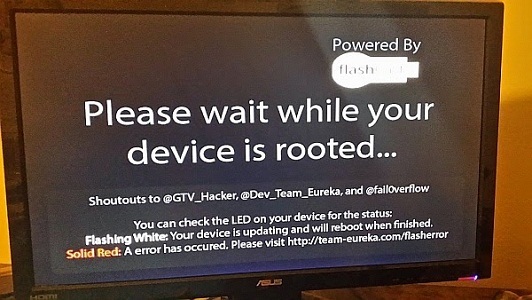 A rooted Chromecast! Google Chromecast vs. Roku Streaming Stick: Which Device Wins?